Nurses are in the frontline of care, especially end-of-life care wherein medical treatments are often no longer effective. As the U.S. society progressively becomes ethnically diverse and aged, addressing diversities of end-of-life preferences among older adults of different communities is paramount to ensure equity of care at the end of life. In the article, “Older Adults of Underrepresented Populations and Their End-of-Life Preferences: An Integrative Review,” we performed a broad literature review to explore diversities of ethnically diverse older adults’ end-of-life preferences based on a repertoire of current and rigorous studies. 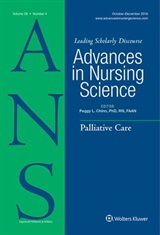 This study can contribute to advancement of nursing knowledge regarding culturally competent care at end of life. In this article, we argue that health preferences and decisions vary due to ethnicity and race. We propose healthcare providers and researchers reflect on different choices and possibilities to provide the context for culturally congruent care and reducing disparities.